Began in southern Texas after Quanah Parker and the Comanches surrendered at Fort Sill in 1875. Due to the failing Post-Civil War economy in Texas. Ranchers developed a 1,000 mile trail to Dodge City, Ogallala and other northern markets to receive rewarding profits. With faith in God cowboys drove millions of Longhorns over the prairie that had been conserved by the Plains Indians in Indian Territory. The Comanches and other tribes became skilled as diplomats and offered the right of passage for Beef from the cattlemen. Many of the human experiences we call "The Wild West" captured the interest of the world evolved here on the Great Western Cattle Trail. Town list were: Ogallola, Buffalo Station, Dodge City, Fort Supply. Comanche Springs, Doan's Crossing, Fort Griffin, Buffalo Gap, London and San Antonio. The Jackson County Farm Bureau and Friend of The Western Cattle Trail. One hundred years after the close of the trail. many descendants of Old Greer County pioneers still live in southwestern Oklahoma. 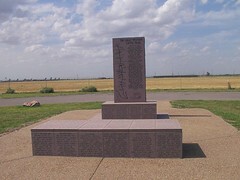 Altus, Ok, Highway 62 Monument is located on the East end of Altus Air Force Base on the north side of highway. 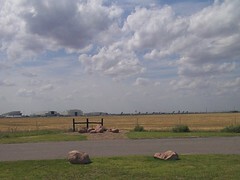 This monument turn out is located on the east end of Altus Air Force Base.